And let's not forget the euro "patterns" that started to appear in the Noughties for the most unlikely countries, including Cape Verde and (I'm not joking) Antarctica! Does anyone have a definitive list of these or know the name of the company or mint that made a living out of this tasteless idea? Back in the 1990s, these atrocious fantasy pieces were denominated in ecus. Here is a 1992 version from and for the UK. To this end we applaud the International Numismatic Agency for producing what must surely be a brave, if not brazen, attempt at pleasing “all of the people all of the time” with their patterns for a set of British euro coins announced this month. Their innovative designs, by renowned British sculptor Donald R. Golder, carry Her Majesty’s portrait on the reverse as expected, but the obverse designs depict symbols befitting a united Europe—the 1 and 2 euro feature a sailing ship (the Santa Maria) representing trade, commerce and the discovery of the new worlds, the 50, 20 and 10 eurocents carry a stylised dove and olive branch symbolising peace and the expectation that Europe will play a pivotal role in the achievement of stability in the world, whilst the scales of justice appear on the 5, 2 and 1 eurocent coins. However, the 5 euro coin is typically British with a new version of Britannia standing, with a globe and the famous Cutty Sark. Somehow, I don't think they know too much about the euro if they think the coins can have two national sides. Or maybe they think that a good pre-condition for entry would be having Elizabeth as queen of Euroland and Gibraltar? We can't have that. Think of all the presidency coins that would have to go un-issued. Agreed. But as José Luis Ramírez writes on his pages - technically the INA medals were pretty good. 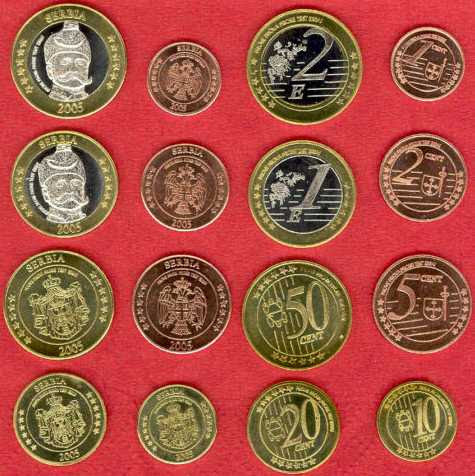 Gibraltar, for reasons that are not clear to me, brought out an educational 14 ECUs "coin" in 1996. 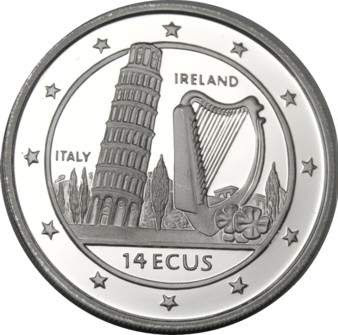 They realised that anyone stupid enough to buy such a piece would not know which countries were represented by a harp and the Leaning Tower of Pisa; so they kindly spelt it out - literally. But let's be honest, anyone who is stupid enough not to know that probably can't read in the first place. 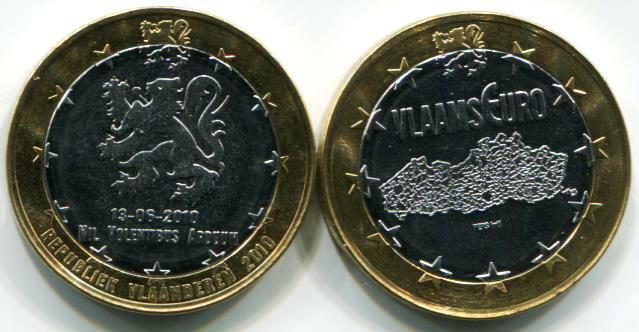 And a "euro" from the "Flemish Republic". Another cheap fantasy. Mongolia "euro" fantasies. The country didn't adopt the euro, but their currency does still end with an "o", so maybe they copied it.